Cdr. Patil gets candid with Ankionthemove about all things nautical and the journey with Dive Goa so far......!!! Cdr. Arun Patil, experienced Scuba Diver and Co-founder of Dive Goa has been a qualified scuba diver for the last 35 years and has first hand experience of a wide range of other water-sports such as sailing, windsurfing , river rafting, boat & jet ski handling, water-skiing and kayaking. He is the founder Principal of the National Institute of Watersports and consultant in water-sports & safety to central and state tourism departments. What inspires you to face the challenges every day? _The fact that at Dive Goa, we are able to introduce so many to the fantastic underwater wealth that may be slowly vanishing as the wild life in our jungles has over the years. The expression of elation and wonderment on the face of the first timers when they emerge on the surface after their dive is the best reward for the hard work of our Dive Instructors that goes into making their dive safe and enjoyable. How safe are water sports in India? As in the case of all adventure sports, you are safe if you follow the laid down safety guidelines. No bravado, no foolish risks. Choose carefully the dive training center that will lay the foundation of your future dive excursions. Update and upgrade your scuba diving knowledge and keep in touch with your basic dive emergency skills. If you do this, you will be safer than while crossing the road in your metro . 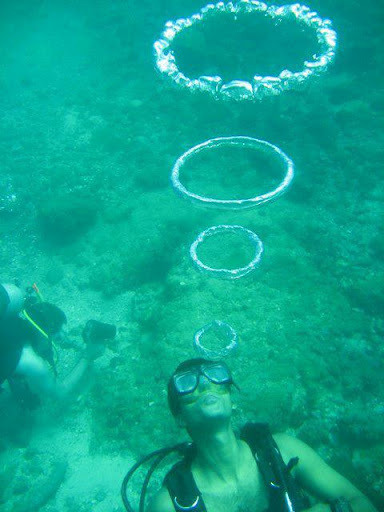 Dive Goa started 5 years ago as a small dive center at Baina beach in Goa. It was basically a one man show of Ajey who has been passionate enough about scuba diving to chuck his merchant navy career and opt for setting up Dive Goa. I joined him 2 years later and we shifted the dive center to its present location in the O Pescador resort in Dona Paula area of Panjim, Goa. In the initial years, our clientele was mostly foreigners. But last year, 85% of our guests were young Indian professionals. We have also seen a trend where the entire family opts to do the certification course together. Your greatest achievements so far? Could you brief us about the Marine Awareness Program? Our most popular program is the half day “ Discover Scuba Diving” in which we take a novice , even a non-swimmer, on a open sea dive after a brief training session in the swimming pool. We have modified this program for our young guests above age group of 12 years by adding a session with the instructor after the dive in which we help identifying the marine life the guests actually saw underwater and discuss what needs to be done to conserve the marine wealth. Slides and handbooks are used as training aids. If there's one social cause you'd love to contribute to in India, what would that Be? Proper disposal of the enormous amount of garbage , wet & dry as well as surface & underwater, that we create every day. Creating awareness at very early stage in children. Your venture is an inspiration for many people who want to chase their dreams and do what they like even if it is out of their league. What would you like to say to them? Anki S Thanks Cdr Patil for the candid chat. Thank you for this. Most people do not relate to Goa as a scuba diving destination. I will definitely spread the word. Would love to go for it!